Home Parker Community Technologies Electromechanical Group Electromechanical Knowledge Base How do I connect an AC10 to a TS8000? 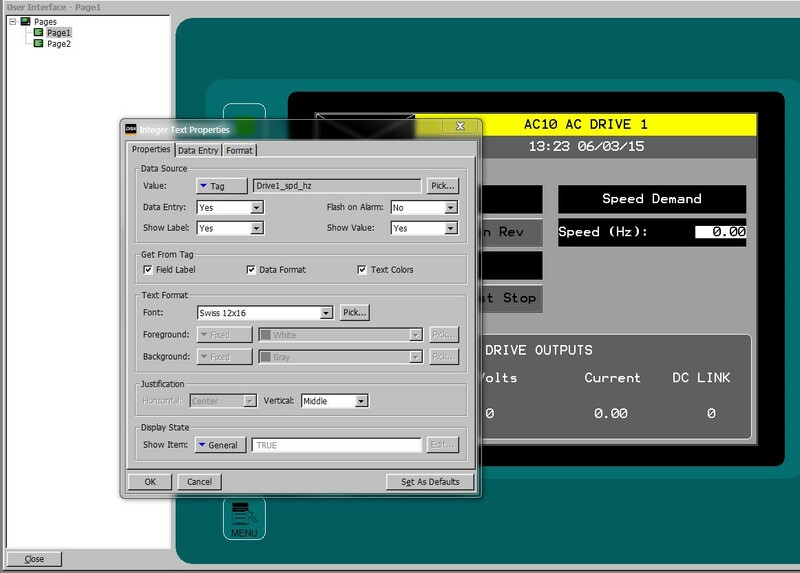 Up to 31 AC10 drives can be connected to a Version 2 TS8000 HMI with Modbus RTU via RS485. Equipment needed:This will require an AC10 drive, a TS8000 HMI and the DSI8000 (or DSI3 software) a USB cable, and a 124 ohm resistor. There is a pre-configured TS8008 configuration example which corresponds to this application labeled 3855_TS8000_to_AC10_Modbus_8_inch.dsi. It is configured for 2, AC10 Drives communicating to a TS8008 HMI 8 inch screen. NOTE: AC10 RS485 MODBUS communications to Version 1 TS8000 HMI is intermittent. It is recommended to use only Version 2 TS8000s. Wire the AC10 to the TS8000. For RS485 2 wire connection, use an RJ45 connector from the RS485 terminal on the TS8000. Pins 1 or 7 connect to the A terminal on the AC10 and terminals 2 or 8 connect to the B terminals on the AC10. 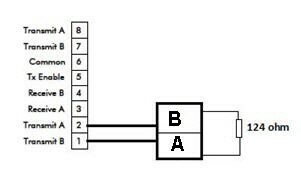 Note: It is required to have a 124 ohm resistor across the A and B terminals of the last drive in the network. Terminals A&B on the AC10 are swapped per the cables markings. Thus the drawing is correct. F900 (inverter address): 13 for Drive1 and 14 for Drive2. Open DSI8000 or DSI3 and select the Communications window. This example was done with DSI. Select the RS485 port by clicking on the icon in the left hand pane. Then click 'Edit' in the top right-hand of the screen and select 'Modbus Master'. 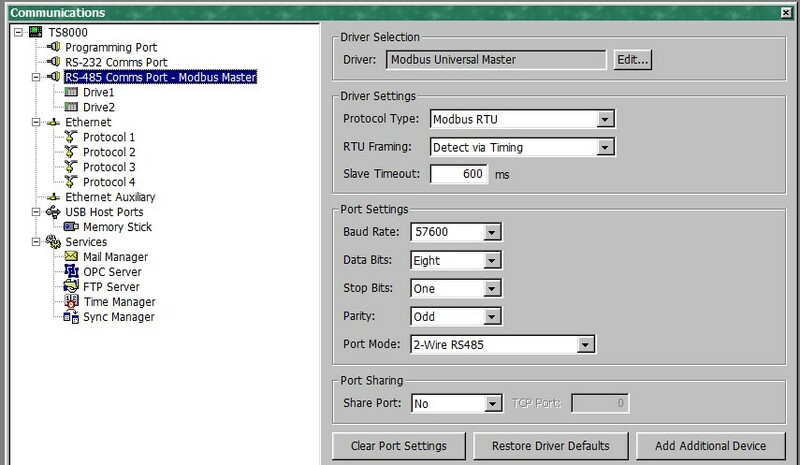 Set the Baud Rate and Parity to match the settings in the drive. Click on PLC1. Select the Drop Number box and enter the inverter address which matches the setting in parameter F900. IMPORTANT: Click the Extended tab and select the ping holding register text box. The number in here must match a "parameter address" in the drive. Set the number in here to 262. This corresponds to parameter F105 Software Version "parameter address" location (The 262 comes from converting 105 (hex) to 261 +1). 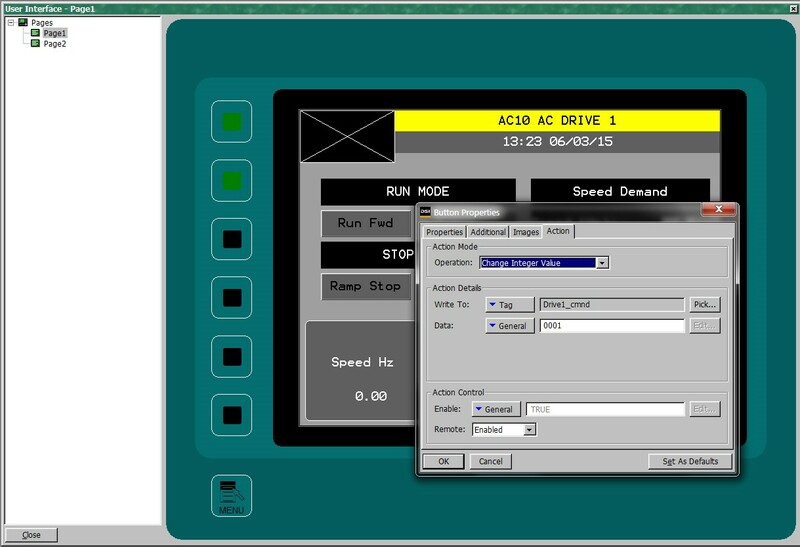 The parameters in the AC10 have to be converted into numbers that can be used in the Modbus registers. Example: F111 (Max Frequency) the parameter number consists of 2 bytes. 01 + 11 Convert these into hexadecimal form to get 01 0B. Convert this back to decimal and add 1. So 10B(h) = 267 + 1 = 268. So the Modbus register = 400000 + 268 = 400268. Close the Communications window and double click on the Data Tags icon. 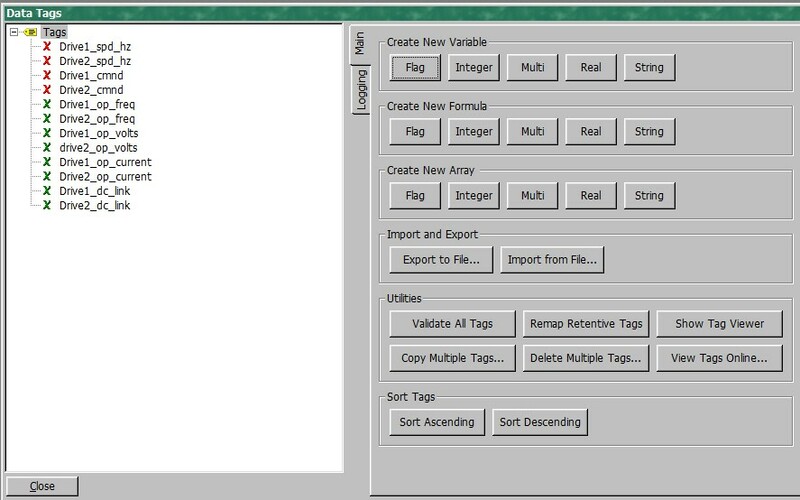 Click on the data tags icon and create integer tags as shown. Name one as Speed and the other as Command. The speed tag will relate to the Target Frequency parameter F113. F113 = 010Dh = 269 + 1 = 270. Command is tag is F2000 = 8192 + 1 = 8193. Set up the "User Interface"
Double click on the User Interface icon. Once the tags are created you can create an integer text box and configure it to enter the speed. The AC10 refers to the Speed in Hertz rather than a percentage as most other Parker drives do. The value of the command tag sets the drive mode. Create A button for each mode and set the integer value to match the function of the button. If you are connected to the AC10 you can download it into the drive by pressing F9. You should now be able to run the drive in both directions and Stop it with either a Ramped Stop or a Coast Stop. More parameters are listed in the AC10 product manual HA502320U001. Note: If the AC10 drive is 'Faulted' communication to the TS8000 will be lost and dash lines will appear for the data values.